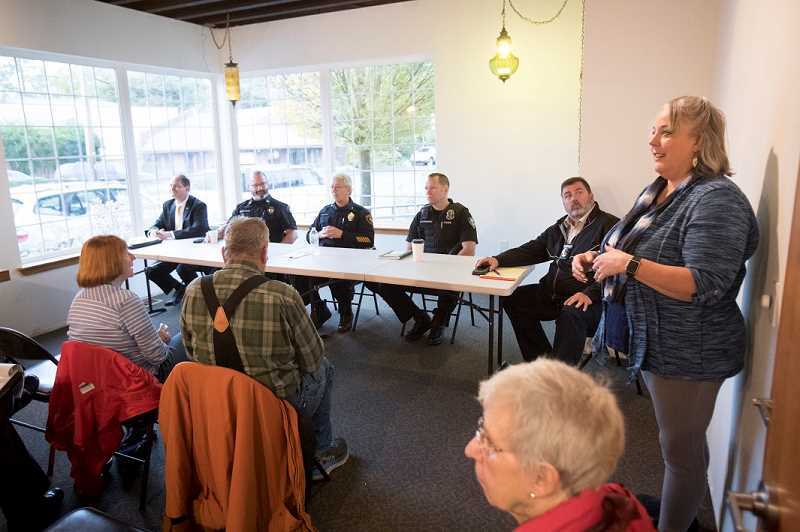 Four police chiefs and a captain gathered in Tigard Thursday to discuss how they deal with those who are homeless. Editor's note: This version corrects the nature of Tigard police calls for service involving "quality of life" issues and the number of homeless indivduals cleared from a camp on 72nd Avenue. 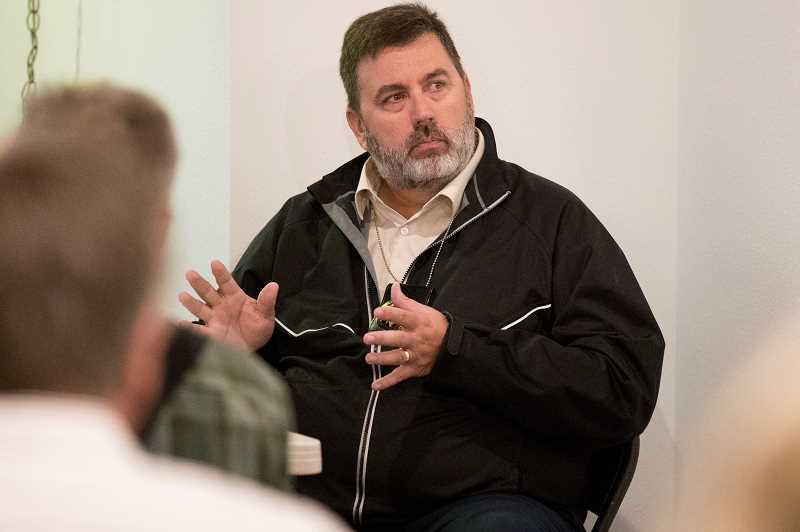 Local police chiefs met with homeless advocates Thursday morning in a Tigard forum design to shed light on how individual cities handle respective issues related to a rapidly growing population in the Eastern Washington County – homeless individuals and families. Attending the meeting, sponsored by Just Compassion, were Beaverton Police Chief Jim Monger, Tigard Police Chief Kathy McAlpine, Sherwood Police Chief Jeff Groth, King City Police Chief Ernie Happala and Tualatin Captain Brian Struckmeier. Just Compassion is a coalition of religious, civic and business leaders whose goal is to help the homeless in the area. 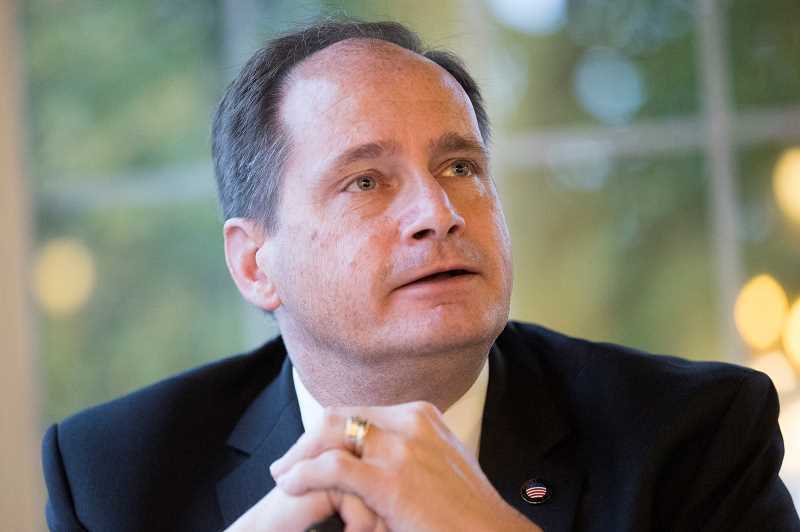 Beaverton's Chief Monger said his department, which shares a border with the city of Portland, has seen the situation homelessness grow over the years, noting that there are several complex reasons for the increase – everything from economic to substance abuse issues. He said his city would like to work with homeless agencies to better address those issues. 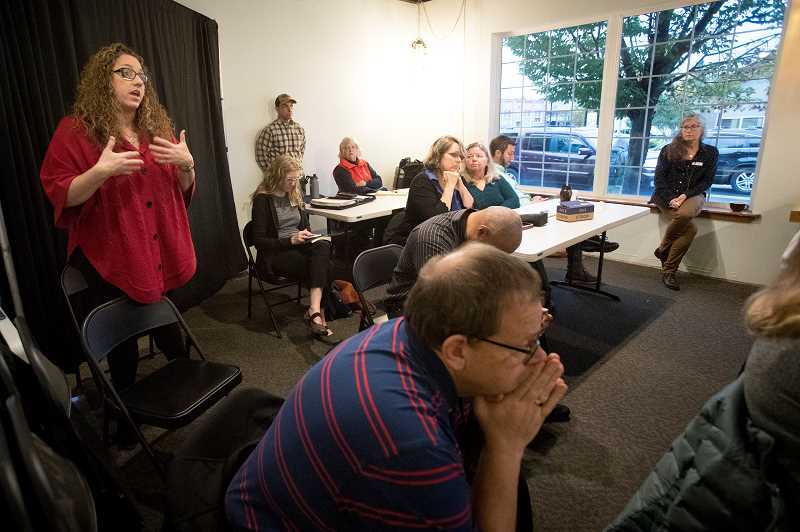 Renee Brouse, director of Tigard's Good Neighbor Center, which aids homeless families, asked each law enforcement official to explain how their department responds to mental health issues involving the homeless. 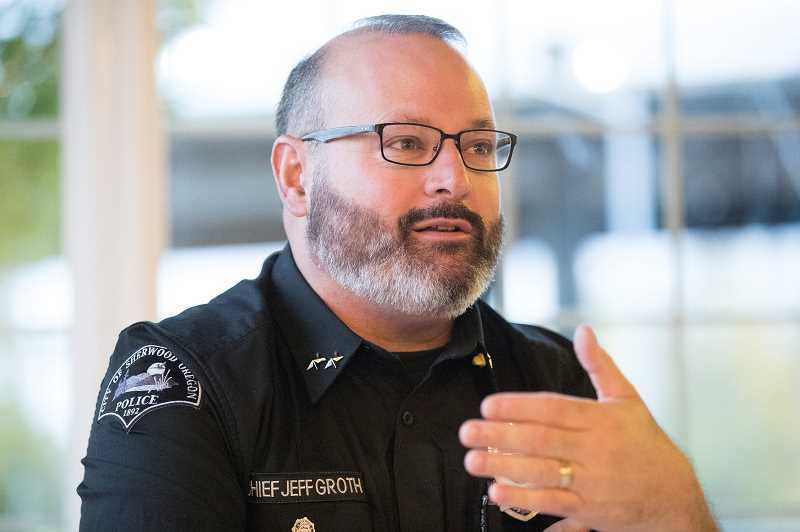 Sherwood's Chief Groth, who previously spent a lengthy career at the Tualatin Police Department, ranked mental health issues as one of the top three issues his department must deal with on a daily basis with the systems in place not always able to handle that increase. "We're starting to see a lot more of this in our community than we did before," Groth said. "We're engaging with more folks on the street than we did before." 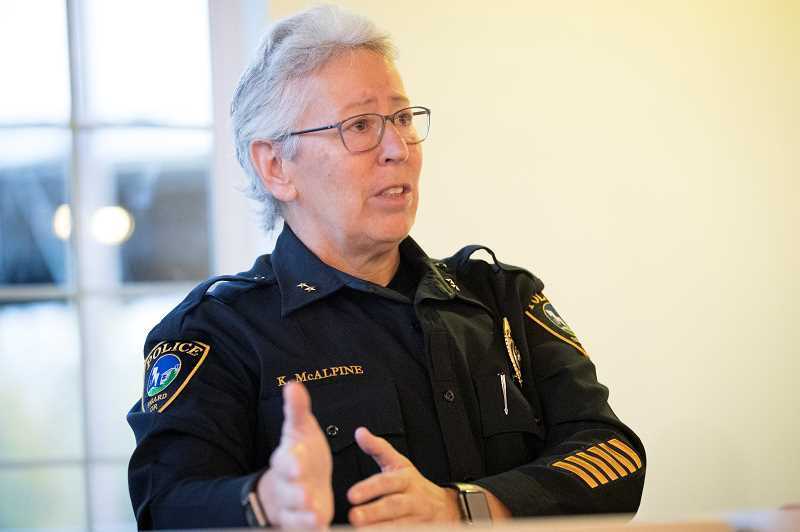 Tigard's Chief McAlpine said about 60 percent of Tigard's calls for service involve "quality of life" issues including mental health crises, substance abuse and homelessness. That puts a high demand on officers, she said. In addition, if police take someone to a mental health facility, that could add an additional two to three hours to transport them to a facility. McAlpine said police are generally the first responders when it comes to dealing with homeless individuals, pointing out that officers' first response is to help those in need instead of taking individuals into custody. Monger said when he first joined the Beaverton Police Department, mental health calls were rare with only one a week coming in. Today it's several each day. Although Beaverton police have two bicycle officers who make regular contact with the homeless, Monger said he wishes the city had mental health clinicians to help as well. "We need to guide these people to the mental health help they need," he said. Still, Monger said not everyone on the street is open to help. "About 75 percent just flat out refuse services or say they want services but don't follow through," the Beaverton chief said. But there are successes as well, he pointed out, saying not long ago Beaverton police were able to find a family a place to stay with rent paid for the next year. Monger said of those 25 percent who do accept help, it's often a last nudge by officers that help those individuals take that next step. Meanwhile he said his city is just getting a safe parking project, which is aimed at providing homeless campers a parking lot where they can camp overnight, off the ground. Thursday's forum also delved into the issues of clearing out homeless or transient camps. Cleaning up those camps often involves major costs, noted Tigard's McAlpine, saying one large camp on private property in Tigard cost business owners $40,000 to $50,000 to clean up. At the same time, while the homeless individuals in the camp were offered payment to help with the camp cleanup, all declined to help out, she said. McAlpine said there are public health issues concerning such camps as well, noting that many pose unhealthy or unsanitary conditions. She pointed to one homeless camp on 72nd Avenue in Tigard where there were a large number of individuals who were camped out and responding police encountered extensive human waste as well as drug syringes. "There is a need to get them out of that environment," McAlpine stressed. At the same time, the chiefs praised the opening in 2017 of the Hawthorn Center, a walk-in mental health facility in Hillsboro, as an important asset for local police departments. "I wish there (were) more," said Monger. "It's a great step between the hospital and jail." "It makes a huge impact because you have a system that's prepared to deal with these folks," he said, stressing that officers sometimes end up taking those with mental health issues to an emergency room where they convince doctors they are OK to be released and are let go. Groth said having more clinicians who are trained to respond to such calls alongside officers would make a difference. King City Chief Happala said he has noted an uptick in the number of homeless individuals his department must deal with, saying over the last few months several homeless individuals were arrested after breaking into vacant homes and staying. Still, Happala said in general he and officers try to refer residents to the mental health services they need. Sometimes homeless individuals can create public safety issues as well. The King City chief said in the past his department has had to keep an eye on one homeless individual who holds a sign asking for help at the intersection of Highway 99W and Durham Road. "He's narcoleptic and falls asleep, and falls into traffic," said Happala. Happala said when homeless individuals need a place to stay, there's a line item in his yearly budget where his department can put someone up in a hotel overnight. At times, Happala has paid for those overnight stays out of his own pocket. 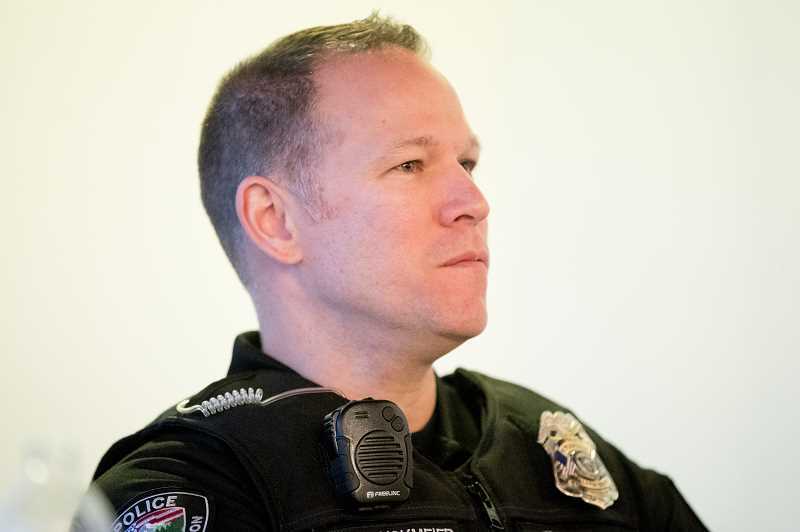 According to Tualatin Police Captain Brian Struckmeier, officers aren't always sure when they initially make contact with an individual on the street whether he or she may have mental health problems. "They don't wear a sign that lets officers know that," said Struckmeier. Like King City, Struckmeier said Tualatin officers try to find a person sleeping in a vehicle the resources they need such as lodging in a hotel. While there are homeless families, they are harder to find, he noted. "It's a rare situation where we see families," said Struckmeier. "They're under the radar." Still, one homeless advocate at the meeting pointed out to the chiefs that there are indeed homeless families in the area, noting she recently saw a family in a King City parking lot who was obviously homeless, evident when they opened a car door and she saw tell-tale signs. The limited shelters for those families are almost always filled, noted those officials who often deal with homelessness. Sherwood's Chief Groth said he knows there's a whole separate segment of folks who are quietly sleeping in their cars, making it less likely that officers will have contact with them. Some of those might be women fleeing domestic abuse situations, part of a silent group of homeless that the chief is most concerned about. Still, Groth said his personal perception is that there is another group of homeless individuals who choose a transient lifestyle. He recalled a situation when he worked in Tualatin that about a half dozen individuals had deliberately chosen such a lifestyle where officers would end up contacting them on a regular basis for drinking in public. Groth said Sherwood has to decide what it wants to do as a community to deal with these issues. "If we can give them a boost, that's huge," he said, adding that all of the law enforcement officials at the forum understand the issue and are compassionate when it comes to dealing with the homeless. Still, how to best deal with homeless individuals is still a matter of debate. Tigard's Chief McAlpine pointed out that for everyone who wants to help out the homeless there is a constituency of residents who don't want tax dollars to go to addressing the issue. However, she said the goal is to let homeless individuals know that police officers are not their enemies and that arrests aren't the best way to deal with issues related to homelessness. "We're going to help, not arrest our way out of it," McAlpine said.